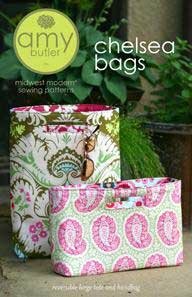 The Chelsea Bags pattern by Amy Butler includes instructions, pattern pieces, and measurements to create your own REVERSIBLE LARGE TOTE AND HANDBAG. This modern, boxy tote and handbag is reversible for your many moods. Clean lines and cool shapes make for an easy access bag with contemporary urban flair!